National Demo: Refugees Welcome Here: Stand up to racism, Islamophobia, anti-Semitism & fascism! Update: For pictures of this demo please see here. Join us this Saturday 19 of March in saying Refugees Welcome! AAfG will be assembling at 1 – 2 Langham Place, W1B 3DE at 12 noon. Join Facebook event here – invite your friends, share and tweet! Join the Europe-wide UN Anti-Racism Day Demonstration when tens of thousands march across Britain, with major mobilisations in London, Scotland and Wales joining thousands in cities across Europe and around the world to say no to racism. 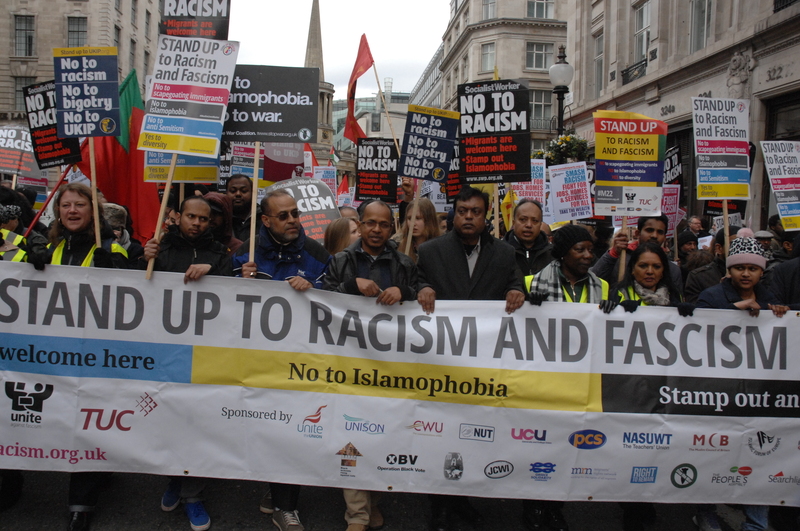 Stand Up To Racism has led some of the biggest anti-racist mobilisations in Britain of the last decade, including the UN Anti-racism day demonstrations of 2014 and 2015 and the 100,000 strong Refugees Welcome demonstration on 12th September 2015.